Shardul Pandey is no corporate boss but a simple leader, whose sole ambition is to create one billion independent employments for his people. 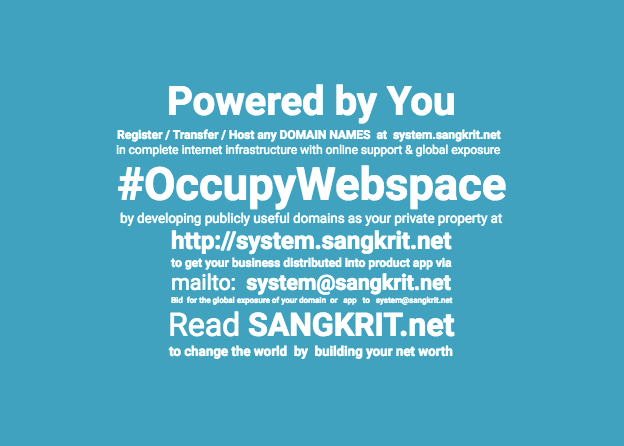 Internet growth engine SANGKRIT.net has globally distributed order headed by its System Administrator. Concurrent System Administrator Shardul Pandey is mostly busy in enhancing cooperation among continuously growing people’s personal outlets everywhere, who actually manage all the business of internet growth. Shardul Pandey is often asked by other corporate bosses that why the system at SANGKRIT.net is not fully automated for absorbing all the revenue possible? Incidentally he himself is no corporate boss but a simple leader, whose sole ambition is to create one billion independent employments for his people. So very reasonably the system at SANGKRIT.net is programmed facilitating for the most massive human role possible instead of absorbing all possible revenue automatically. Profitmongers naturally refuse to respect the gaps given to get fulfilled by the human technology but Sangkrit is made around that only. Thus it is truly said to be powered by you. You must come forward for generating one billion employments for freedom loving people on planet earth. Sangkrit is the program for efficiently doing that by opening people’s personal outlets, programming and selling the internet growth, involving everyone around. People’s personal outlets independently cooperate by paying fellowships to each-other as per individual requirements. They work together and grow together in a globally distributed order, where any revenue is made only by some humankind direct in his or her personal bank account. Building individual trust and friendship works everywhere in the course of developing this business. What matters most is together developing one billion personal outlets serving all possible web-app requirements of five billion people worlwide. That is called Sangkrit being an all-inclusive execution.